All India Babri Masjid Action Committee leader Syed Shahabuddin passed away on 4th March 2017 morning in Noida hospital after a prolonged illness. He served as an MP for three terms between 1979 and 1996, and also successfully campaigned to ban Salman Rushdie's novel The Satanic Verses. 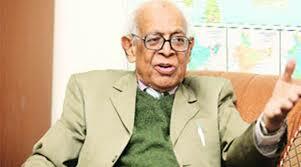 Shahbuddin, has been famously known for he was a leader of Babri Masjid action committee. Syed Shahabuddin previously worked as an Indian Foreign Service officer and also led the All India Muslim Majlis-e-Mushawarat - the country's top-level forum for Muslim organisations. Mr Shahabuddin was also the head of the Babri Action Committee, an organisation dedicated to the preservation of a 16th Century mosque in Ayodhya. The contested ownership of the site and its eventual demolition created national tension between Hindus and Muslims.